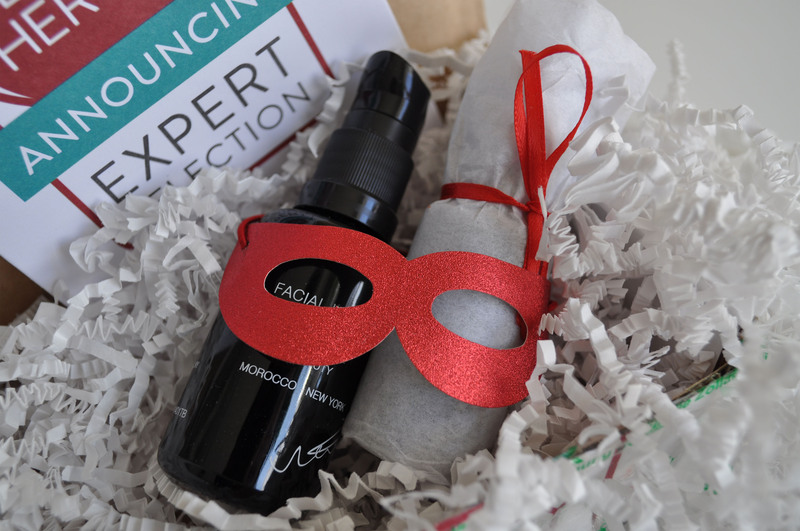 This has been a while in the making, but Jeannie from Beauty Heroes and I have been testing the feasibility of the Beauty Heroes Box shipping to Germany. 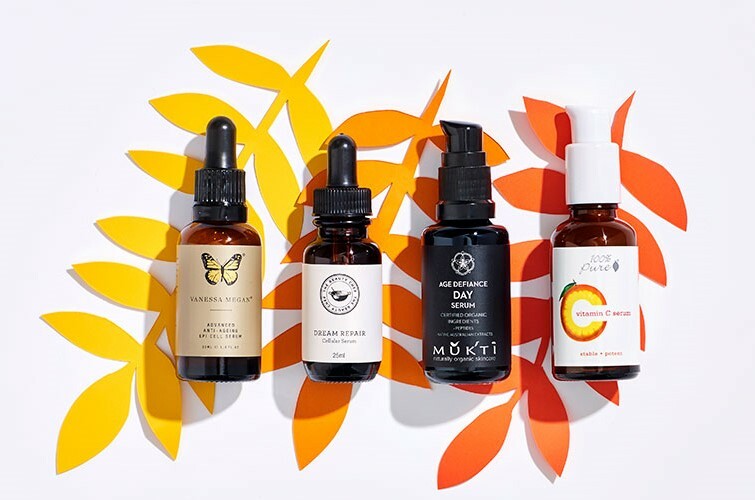 First off, for those of you who may not know what the Beauty Heroes Box is, it’s an amazing beauty subscription box from the US which only sends you fabulous non-toxic products. Each month features a new brand and you receive one full size “Hero” product, as well as a “Sidekick” product – this can be anything from a deluxe sample, up to another full size product. Every featured company’s products contain only non-toxic, high quality, natural and organic ingredients. 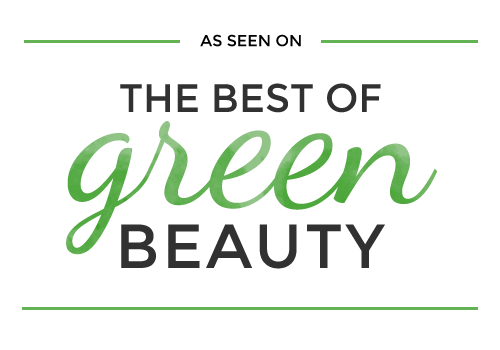 A fantastic way to get to know many new brands in the clean/green/organic beauty sphere. Previously featured brands include Mahalo, Innersense Organic Beauty, and Josh Rosebrook, just to name a few. They also provide you with an awesome free guide to ingredients, and they’re separated into Superpower and Villain ingredients. Beauty Heroes will help inform you what ingredients to look for depending on your need, as well as what ingredients to avoid and why. A very useful guide! Anyway, back to my box! 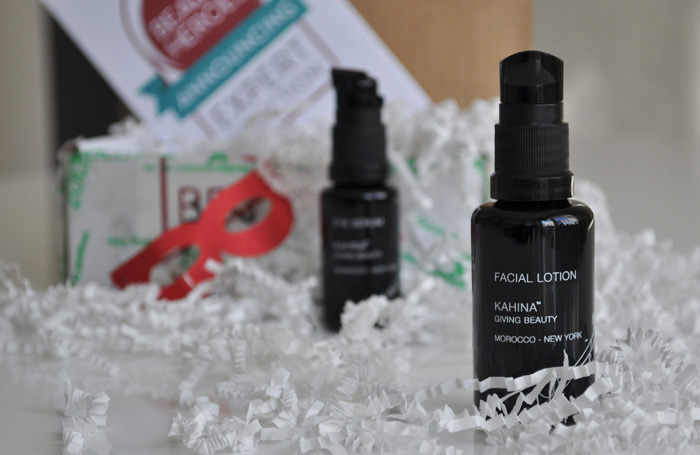 I ordered the September Box which featured products from Kahina Giving Beauty. 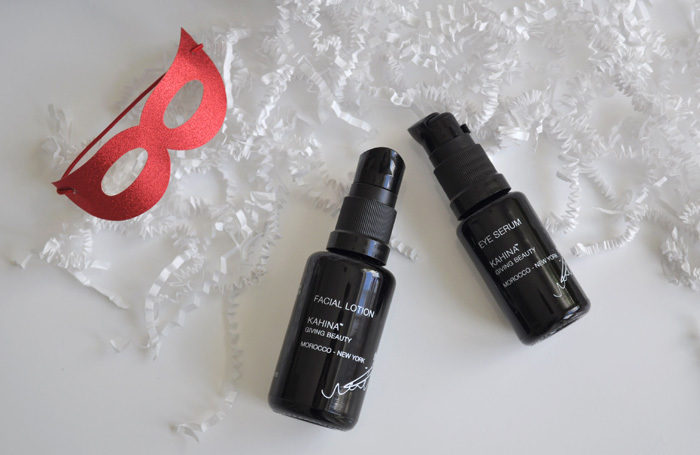 The Hero product was a full size Eye Serum (15ml) and the Sidekick was a lovely travel sized Facial Lotion (30ml). Germany, being Germany, of course got my box caught up in customs, and I had to visit my local customs office (10 min drive for me) to pick it up. As I have now found out and can now tell you all, the threshold for tax free ordering overseas in €22. Anything above this amount you have to pay 19% VAT on. So when I went to the customs office I took with me proof (a print out of the Beauty Heroes website) of how much the box would have been if I had paid for it ($39USD). So in the end I had to pay just over €6 in taxes. Not too bad… If they had wanted to look up the actual value of the products inside, I would have been in a bit more trouble… The Eye Serum alone is €78 on amazingy.com. I love using this luxurious product to give the delicate skin around my eyes a little LTC. I have been on the hunt for a great facial lotion free of SPF for those lazy days at home or when I just really don’t need to have any extra ingredients for sun protection. This cream is light, but also very rich once applying to the skin. I haven’t used it too much yet, but the couple of times I have tried it I did really like how it felt. 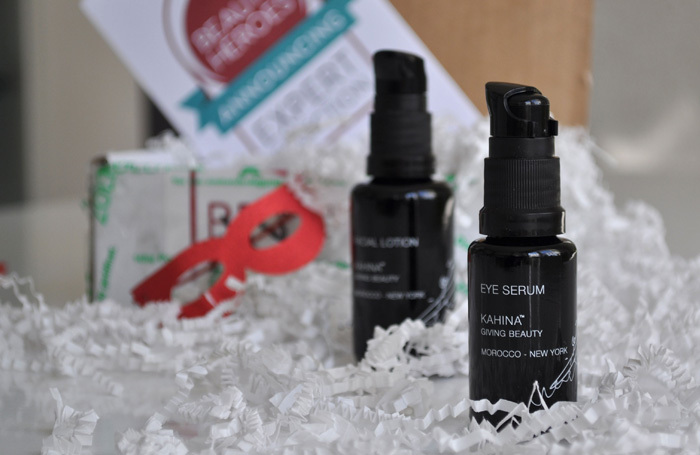 All in all the Beauty Heroes box is pretty great value at $39USD per month, the products you receive will be valued from at least $60 to $100+USD (the Kahina box is valued at well over $100USD, and at least €100 from my estimates). Subscribers also receive a 15% discount in the Beauty Heroes online store. Jeannie thinks shipping costs will be around $12.95USD (same price for shipping anywhere outside the US), but not 100% certain just yet. Hi Anne, I’m so sorry I didn’t see this comment sooner! Have you had any luck since posting this? I can talk to me contact at Beauty Heroes if you like? That’s really exciting news! I’ve been following Beauty Heroes on IG for too long, and every box I’ve seen has been much coveted. I’m very tempted by this as the shipping rates are actually quite reasonable. You’ve twisted my arm!